Howdy my people, how’s your weekend going? Less I forget, Happy Children’s day to all my reader’s kids. Dear parents, I hope you took your kids out today, so they can have a great time? Please if you haven’t, it’s not late; kids deserve a fun time. Now back to the reason for this post, I saw Slow Country today. I had read great reviews about the movie online and I decided to go see it for myself today, and I took great pain and lengths before I was able to see it. Let me explain. Normally before I see any movie I usually check online to know the movie schedule for the week and in which cinema it would be showing. In Abuja where I stay, we have only three (3) cinemas (very annoying) so your option is really limited as to the movie to watch. When I checked online, Genesis Deluxe Cinema in Ceddi Plaza and Silverbird Cinema in Central Area were showing the movie. The third cinema which is Silverbird Cinema in Jabi wasn’t showing the movie. Not only did I want to watch a movie I also wanted to buy a House of Tara red lipstick. House of Tara is located in both the Jabi Lake Mall and Ceddi Plaza which also houses cinemas so I had to choose the cinema that was in the same location with HOT, you know na, killing two(2) birds with one stone. I have never been to Genesis Deluxe so I decided to go there to watch it. I got to Ceddi Plaza excitedly, went upstairs to Genesis Deluxe to buy the movie ticket, only for me to be told the movie wasn’t showing. I was mad. Their online site stated that the movie would show today been Saturday and I could not understand why a site would be saying one thing and the reality is another thing. 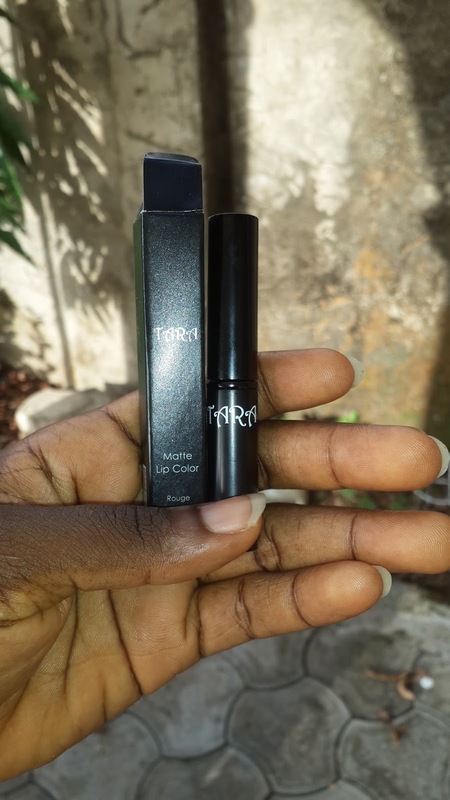 I then decided to get to House of Tara to buy my lipstick. I specifically wanted HOT red lipstick; cos it’s the best or rather I love it. I’ve used a lot of red lipsticks and HOT lipstick stands out. After I bought it, I cleaned the one I had on and used it and I loved it all over again, lol. You guys should try it out, the only downside I think is, I feel it’s too slim for the price; asides that it’s great. Now to my review of Slow Country: Slow Country tells the story of a homeless teenage mother (Ivie Okujaye) who gets herself trapped in prostitution and drug trafficking for seven years in order to secure a good life for her son decides to quit but her boss, a ruthless human and drug trafficker (Sambasa Nzeribe) is not ready to let go of his most trusted cash cow. 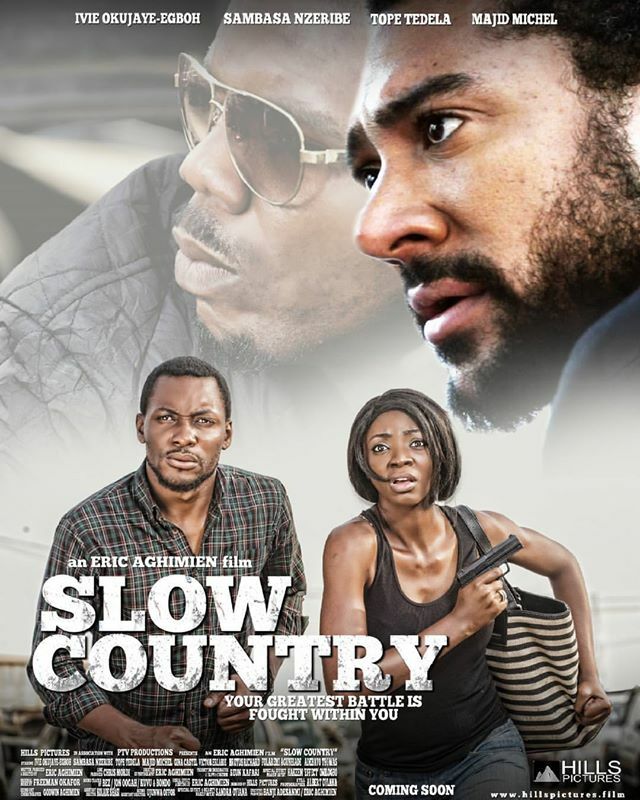 The movie is rightly named slow country, cos most of the movie was just slow. In fact so slow, I became so hungry I started wishing I was watching the movie in my room and I could just fast forward it; at least to get to an action part. The dialogue was too long, some shooting scenes especially where Tuvi engaged Brasko in a gun battle was unnecessarily too long. When I had completely given up that the pace of the movie would pick up, that’s when the action began. But that’s towards the end of the movie and it doesn’t stop till it ends. Regardless, I would say it is the best Nollywood action film (not like the action genre is something nollywood does). But if there are other action movies, then this is the best. At least in terms of the special effects, cinematography, props, costume and the set design. This is a nollywood film that the action was real, the blood looked real, and the makeup on point. For that, I love the movie. I also love the acting; at least most of it. The star of this movie is Sambasa Nzeribe. Jezzzz he acted as a villain and he’s so believable you would think that’s how he is in real life. I wrote something on his page, the fear of Tuvi is the beginning of wisdom. He won an AMVCA for his role in the movie and he totally deserves it. Tope Tedela was also on point in his role as Osas. He was very impressive. Ivie who acted as the prostitute was mostly believable, but sometimes I felt she didn’t connect to her character. Adebayo Thomas who acted as Ivie’s son was great, very impressive; that child would go places. Majid who acted as a police detective did nothing extraordinary, he was just there. There was a character that kinda left me confused; Femi. Femi was the innocent aid of Tuvi who kept giving me the impression he was gonna take a gun and kill Tuvi. But he never did. If indeed you have compassion on your boss victims and don’t approve with what he does, why not take a gun and end his life? There were some misses sha, especially at the beginning when Majid the police detective was chasing a drug peddler, his assistant was in the car. All of a sudden when Majid catches the guy, we find his assistant there also, how did that happen? Maybe he flew sha, I don’t know. Also, at the last scene when the detectives were engaged in a gun battle with Tuvi and his men, they didn’t or should I say they refused to call for backups; who does that??? Abi na so Nigerian Police dey do??? Slow Country requires a lot of patience to watch this movie, but I believe you will love it. Even though I left the cinema hall underwhelmed, I almost started regretting seeing it. But Eric Aighmein (the producer) must be commended for this movie, the action genre is what must Nollywood producers fear to venture in, but he did and it was a great effort. The movie is still showing in cinemas nationwide if you want to watch it, and when you do, let me know what you think of it. And if you have seen the movie, let me know in the comment section what you think of it. Thank you for reading and do have a fabulous holiday.